Apparently, there are still some people who care about the elderly in this country. In a very heartwarming video, a group of Black men are shown helping a frail 89-year-old woman as she struggled to get into her vehicle after she and her 100-year-old husband made a bathroom pit stop during a road trip, Yahoo reports. 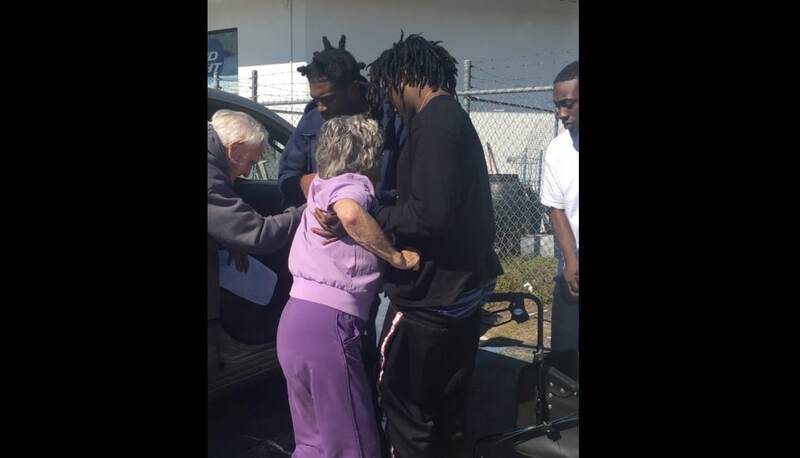 On Monday, Officer Kenesha Carnegie of the Levy County Sheriff’s Office in Bronson, Fla., was in Williston when she witnessed Rose Griest, 89, get helped into her car by the three men. Her 100-year-old husband, David, had parked at a gas station so she could use the restroom after riding from a doctor’s appointment in Perry, Fla., to their home in Orlando nearly 200 miles away. It’s unclear as to why would an 89-year-old and a 100-year-old were traveling unaided on a three-hour road trip, but for now the video of the good deed by the young men is warming hearts and getting the attention it deserves with more than five million views. “I look over and three men were assisting the couple — it was a beautiful thing to see,” says Carnegie. She recognized the men, identified as Joc Koe Stoe, Marty and Freddy G.
Carnegie asked for permission to film and stepped back to allow the good Samaritans to step in. “I know these men from the neighborhood, and I wanted them to have that moment to show who they really are,” Carnegie told Yahoo Lifestyle. In Carnegie’s video, it shows two of the men helping Rose to stand as she struggled to gain her footing. David, her husband of 20 years is right there too, holding her hand. Another man enters to help David with his walker. “Take it easy,” one of the men said. David then gets into the driver’s seat. Marty said he and his friends were at the gas station grabbing snacks and drinks when they saw the elderly couple. Stoe, 26, told the Yahoo that Rose was spent after using the store’s restroom. David and Rose have somewhat become social media stars.